In a faraway place and time, dusk falls upon a lonely land. The last fleeting rays of dull sunlight disappear behind the distant horizon as a somber gray hush falls over the barren forlorn landscape. A lone city rests upon a grand precipice overlooking the valley. The city is abandoned and lonesome. Structures that once represented skyscrapers and buildings of all shapes and sizes, now crumble and fall into piles of rubble. A grand, majestic cathedral sits at the center of the city. The edifice stands untouched by the desolation that left the remainder of the city in shambles. A tall figure, dressed in a light robe, climbs the cobblestone steps of the cathedral with cautious confidence. Dark, ominous clouds drape the evening sky with a thick, black mantle of uncertainty and an eerie apprehension filled the air. The icy cold breeze stung his cheeks and whipped his robe swirling around him. Fallen leaves whirl around furiously as wind gusts blow across the steps. He pulls his hood closer about to disguise himself. In the courtyard to his right, a murder of crows mocks the evening air from barren trees, whose branches resemble bony rigid hands and claws reaching for something to hold on to. Hundreds more quarrel amongst themselves in the graveyard adjacent to the courtyard. To his left lay the remains of a once beautiful rose garden bordering cracked cobblestone paths. Black thorns and vines twist across the ground and spill over broken retaining walls and concrete benches. A desolate wasteland stretches from there northward, for miles. The cathedral stands in terrifying majesty as the only edifice that remains standing in a ghost-like village of crumbled and decaying ruins. The garden nestles between the church and an abandoned building that appears ready to crumble to the ground. Four red oak trees line the walkway, parallel to the front face of the edifice, at the bottom of the steps. Unlike any of the other trees in the surrounding courtyard and town, these four still bear leaves of fiery red and orange. They dance in the breeze like flames licking the air. The trees stand in contrast to the gray somber scene around them. He continues his ascent towards the cathedral’s large, dark-stained, oak door. Two massive gargoyles flank the porch way leading to the door. 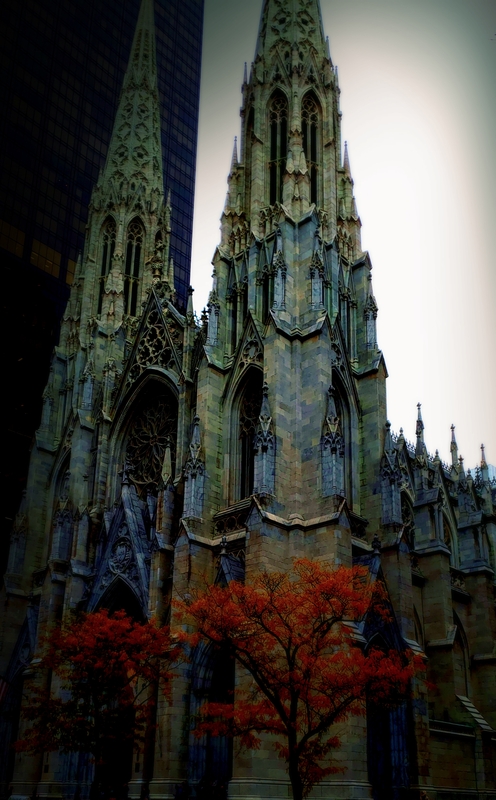 They stand erect as guardians to the cathedral and the darkness what lay within. The figures resemble demon wolves or – werewolves with massive wings folded across their large backs. A soft green iridescent glow radiates from their eyes and a mist-like essence swirls around their ferocious beings. A steady, demonic growl resonates from deep within their stone embodiments as a warning to any visitors to stay away. They appear alive and ready to pounce on trespassers. A large raven glides down from its perch atop one of the buttresses above and lights upon the stranger’s shoulder. It peers sharply at him with a deep midnight gaze, twisting its head from side to side. It lets out a loud screech, announcing its presence and then snaps its beak in satisfaction. Upon hearing this sound, the murders of crows in the courtyard cackle their joyous response. The stranger reaches from within his robe and produces a few morsels, which he offers to his new companion. The raven chatters its appreciation and ruffles its feathers as it nestles on his shoulder. A few more crows fly up from the courtyard and land on the steps in front to meet him. They squawk in furious disarray as he approaches the door of the Gothic edifice. His newfound companion squawks a command and the crows scatter and fly high. Circling the cathedrals towering spires, they find new homes on the flying buttresses and gargoyles above. He pushes the door open and enters. With every step, a growing anxiety rests upon him. He stands in a vestibule extending to three pillars directly in front of him. A long narrow nave stretches beyond the pillars, flanked, on either side by aisles. The aisles, barely visible, hide beneath the shadows of nightfall. A large confessional stands near the front of the left aisle, shrouded in the shadows. A beautifully painted, ribbed vault spans above and cascades down until it meets six stained glass windows that filter the dim dusk light into the center of the nave, illuminating rows of pews in a dull dusty light. A musty smell hangs over the vastness of the room. It reeks of death warmed over. The dark, oak floors bulged as if ready to release the ancient demonic souls trapped in the crypt below. With each step, the floor creaks and moans hellish tunes of violence and death. “Come in my son. Come in.” A strident voice breaks the uneasy silence.